Kuck Immigration Partners LLC has just opened new offices in Salt Lake City and Provo, Utah. Top immigration attorneys, Barbara Melendez and Tim Wheelwright, are joining the firm as partners. Kuck Immigration Partners LLC is a nationwide immigration law firm providing services to businesses, investors, families and individuals in all areas of immigration law, including employer compliance, immigrant and non-immigrant visa processing, family immigration matters, removal defense, and asylum. [W]e are excited to have Tim Wheelwright and Barbara Melendez join our nationwide immigration practice as partners. I have known Tim and Barbara for many years, They are both some of the finest immigration attorneys I have ever known. Kuck Immigration Partners is pleased to announce that Timothy M. Wheelwright, Esq. and Barbara V. Melendez, Esq., along with their immigration staff members, are joining the new Kuck Immigration Partners offices in Salt Lake City and Provo, Utah. Along with their highly trained and experienced staff, Mr. Wheelwright and Ms. Melendez will establish Kuck Immigration Partners as the leading provider of immigration law services to entrepreneurs, employers, and families in Utah. 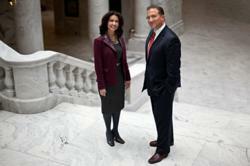 Mr. Wheelwright and Ms. Melendez are two of the most recognized and experienced immigration attorneys in Utah. They join Kuck Immigration Partners from two top law firms in Salt Lake City, Durham Jones & Pinegar and Kirton McConkie, respectively. Mr. Timothy Wheelwright has been representing companies and individuals in legal matters involving United States immigration and nationality laws for more than 15 years. On July 1, 2011, Governor Gary R. Herbert appointed Mr. Wheelwright as a member of the Utah Commission on Immigration and Migration. Additionally, he is the chairman of the Salt Lake Chamber of Commerce's Immigration Task Force, the chairman of the Davis Chamber of Commerce's Immigration Subcommittee, and the vice-chairman of the Ogden-Weber Chamber of Commerce's Immigration Task Force. Mr. Wheelwright has been consistently listed in The Best Lawyers in America, Mountain States Super Lawyers, and Utah Business magazine's "Utah Legal Elite" in the category of Immigration Law, as well as in The International Who's Who of Corporate Immigration Lawyers. Mr. Wheelwright is a former mayor of Pleasant View City. He actively works to promote sound immigration policies and to bring about substantive and workable improvements to federal and state immigration laws. He joins Kuck Immigration Partners from the law firm of Durham Jones & Pinegar. Mr. Wheelwright can be reached at TWheelwright(at)immigration(dot)net. Ms. Barbara V. Melendez brings to the firm more than 15 years of experience in immigration and nationality law. She counsels employers on immigration and compliance matters, and focuses on assisting both individuals and companies in all immigration matters. She is a former Adjunct Professor of Immigration Law at Brigham Young University, J. Reuben Clark Law School, and is a frequent national lecturer on immigration issues. She is on several advisory boards including the Salt Lake Chamber's Immigration Task Force, and has been appointed by Governor Herbert as a member of Utah's Commission on Immigration and Migration. As noted in Utah Business Magazine, she has been consistently recognized by her peers as being one of Utah's "Legal Elite," and has been listed nationally in The Best Lawyers in America and as one of the top immigration attorneys in the U.S. Ms. Melendez joins Kuck Immigration Partners from the law firm of Kirton McConkie. Ms. Melendez can be reached at BMelendez(at)immigration(dot)net. The Utah office of Kuck Immigration Partners will be located at 136 East South Temple, Suite 100, in Salt Lake City, Utah. The Provo office will be located at 1215 North 500 West in Provo. Kuck Immigration Partners will continue their focus on providing excellent immigration legal services at affordable cost. Charles H. Kuck, the Managing Partner of Kuck Immigration Partners said: "[W]e are excited to have Tim Wheelwright and Barbara Melendez join our nationwide immigration practice as partners. I have known Tim and Barbara for many years, have worked closely with both of them on a number of complicated immigration matters and am honored to have them part of our firm. They are both some of the finest immigration attorneys I have ever known." Kuck Immigration Partners LLC is a nationwide immigration law firm providing services to businesses, investors, families and individuals in all areas of immigration law, including employer compliance, immigrant and non-immigrant visa processing, family immigration matters, removal defense, and asylum.